Catch The Window! 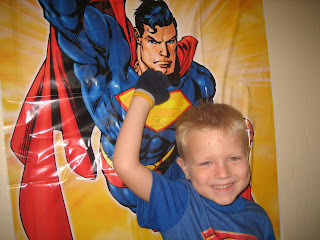 : Capes, Capers and Cake! Benjamin just had a birthday! My boy is four now, and it's so fun to see. The lucky duck had TWO birthday parties. 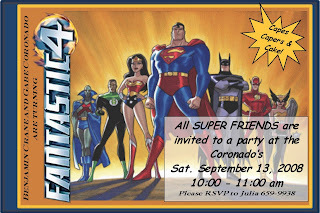 We planned this combined birthday party with our friends, the Coronado's, whose son Gabe is also turning 4 this month. However, after all invites had been sent out Matthew got an interview call to Cincinnati - which resulted in a small family party as well so that daddy could be there. If you ever wanted to know how to have fun with a ton of kids though, here's my recipe. Make everyone a cape. Julia and I split up the tasks of making reversible capes for each munchkin. It took longer than I had anticipated, but the kids absolutely LOVED them. :D Sooooo satisfying to see them running around with capes flailing behind. We heard a lot of "Dunt duh-da DAAAAAAHHHH!" Hilarious. 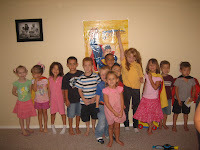 They colored, got to play "pin the S on Superman," and ran around while listening to the "Lazy Town" soundtrack. 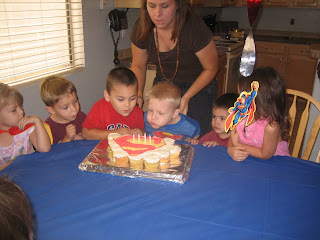 Julia made the fantastic Superman pull apart cupcake, uh, cake. It was perfect for the party AND tasty! And the biggest party pleaser? I didn't think much about it when Julia told me that there would be water balloons. To huck. Not a fight, just a balloon hucking activity. Hmmm, okay. I was skeptical, but since she didn't ask me to do anything, I was happy to let it ride. OH. MY. GOSH!! The kids LOVED it! 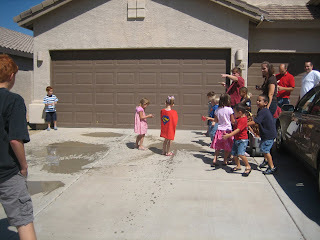 There was a cooler full of water balloons, and after the lid opened, they got to grab a balloon and huck it - anywhere! On the ground, on the garage, into the gravel. They didn't care! They just loved watching them splash. THe peels of laughter and giggles could be heard for quite awhile, and in the end, it was over way too quick. I would do it again in a heartbeat. Everyone helped to clean up the rubber on the carport, and there were smiles all around. IT was awesome. :D Thank you Julia for showing me a better way! I have the happiest four year old because of it. Nota Bene: How do you know you're married to a comic book nerd? When he looks at your inviation and says, "You mixed DC Comics and Marvel you know . . . "The Fantastic Four" and "SuperFriends" are from different publishers . . ."
just because water balloons cost a few bucks doesn't mean that they won't be "cool" or fun.... and you thought it was going to be lame. ha! that's what you get for not having faith in a sista. *don't you be trying to take credit for the capes' logos! ;) you ain't no sweat-shop-girl intimidator! the dc comics and marvel thing is a guy thing because E noticed too! LOLOL!! "don't mix DC and Marvel". It would us be like, "you've just put a pink dress and a red dress together. They totally CLASH." This looks like so much fun! Can I hire you gals out? Happy Birthday, Benjamin! Considering his birth weight......I can NOT believe how big he is! LOVE the capes.....what a fantabulous idea! hehe The fabric for Jack's is still sitting in the bottom of the closet here.....kudos to you guys!